HQ South Western Air Command Recruitment 2018-2019 Notification is issued by the India Air Force Officials. Therefore, all those people, who want to work with the Indian Air Force can check this Latest Indian Air Force Recruitment 2018-2019. Accordingly, the officials are for looking efficient and hard working contenders for 54 Group C Civilian Vacancies. And it has posts like Multi Tasking Staff, Lower Division Clerk, House Keeping Staff, Mess Staff, Laundryman, Cook, Carpenter, Painter Vacancies. 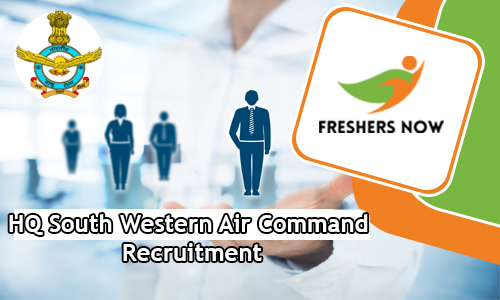 Therefore, all those people who are interested in applying for these Vacancies can proceed and find out the details related to the HQ South Western Air Command Recruitment 2018-2019. So, as per the information in the notification, all the people who are interested and have had all the qualifications should apply before the closing date. According to the notification, the officials of the India Air Force asked the people, to submit the application form by 11th April 2018. So, the new HQ South Western Air Command Recruitment 2018-2019 Notification is creating the positive vibes among the people who are hunting for the jobs in a Reputed government organization. Accordingly, the officials of India Air Force is looking for some Fresh Energetics for the 54 Vacancies. Therefore, those contenders who are willing to work with Indian Air Force can check the requirements and can apply immediately. As the officials are accepting the applications for HQ South Western Air Command Recruitment 2018-2019 from 10th March itself. Therefore, contenders need to hurry if they want to withhold the Chance of getting placed. Now, as per the information in the official HQ South Western Air Command Recruitment 2018-2019 Notification, all the people should have the correct Education requirement. Applicants should finish either 10th Class or 12th Class from any recognized institute or Board in India. So, many of the people are searching for HQ South Western Air Command Recruitment 2018-2019 Notification. And yet not succeed in getting correct information. Here we are giving them all for the sake of the contenders. As per the information in the Notification along with the Correct Education, age limit also matters for the validation of the application form. Therefore, all the contenders should check the age limit. As per the information in the HQ South Western Air Command Recruitment 2018-2019 Notification, the age of applicants can be between 18 years and 25 years. But this not crosses the limit. Also, for the age relaxation, you can always check the Notification which we have given at the end of this post. Now, coming to the applicatio fee, all the people should pay the application fee, if there is any. According to the information in the HQ South Western Air Command Recruitment 2018-2019 Notification, there is no mention of the application fee in the advertisement. But it would be ideal for the people, to refer the notification twice before submitting the application form. The officials of India Airforce are pretty considerate when going through the applications. They are inviting the people, for the next rounds only if they are eligible and have had all the qualifications correctly. Therefore, keep this in mind and apply. Or else you will feel some disappointment if the officials reject you. Now, after the completion of Application submission process, all the people should know about the Recruitment Rounds. As per the information in the official HQ South Western Air Command Recruitment 2018-2019 Notification, the Indian Air Force Officials are going to choose the best and efficient people. And for this purpose, they are going to conduct some Recruitment Tests. According to the information, all the people should pass both Written Test and Personal Interview. All the individual will go to the personal interview, only if the clear the Written Examination. Therefore, all the contenders have to keep this in view and prepare. On our site Freshersnow.com, all the aspirants can find the relevant help in getting the preparation materials. Therefore, please check them all and prepare. Now, the selected people will get the Salary as per the norms of the organization. As per the information in HQ South Western Air Command Recruitment 2018-2019 Notification, all the contenders will get the salary between Rs.18,000 to Rs.19,900/- Per Month. Now, all the people who are looking for the Government Jobs in India, particularly, Air Force Jobs, can use this chance. So, the Indian Air Force officials are going to reject the late Applications. Now, the officials mentioned in the advertisement, that they will see some requirements in the contenders while going through the submitted application forms. So, Now, all those people who are in deep Job hunt can use this chance for getting placed in a reputed organization like India Air Force. Remember that you need have had all the qualifications correctly, as of on time of applying. So, there is no application Fee. So, all the interested candidates can check the following points to apply for the HQ South Western Air Command Recruitment 2018-2019. Therefore, follow the following points. Check for the HQ South Western Air Command Recruitment 2018-2019. Read all the given requirements. And Fill the details in the application form. Therefore, Recheck and submit the application form before the last date.